You are home! 222 Windward Lane in the Blue Creek area of Lake Martin is a great family home for your lifestyle. Sitting at the end of a long, wooded, private driveway this lake home has plenty of space inside and out for your friends and family. Inside are 2 living areas with 2 kitchens – one on the lake level and one on the main level. A large sleeping area on the lake level will accommodate three sets of bunk beds while still leaving room for a sofa and chairs, a pool table or a ping pong table. The lake level also contains a full bathroom. The main level includes the master suite, kitchen, large living room, a laundry room with bonus storage space at the entrance and a guest bathroom. The top level has two bedrooms, a bathroom with a cool skylight and a cozy reading nook or play area. Outside? A storage building, two carports and other parking areas along with an area to park your boat trailer and an RV with electrical hookup. 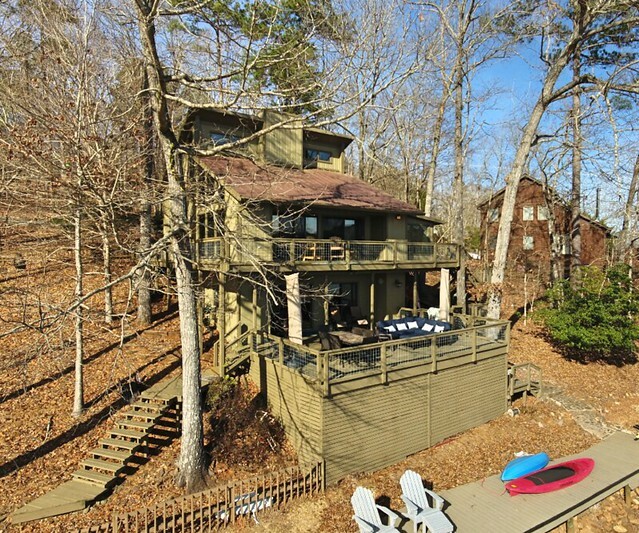 Two welcoming decks let you enjoy the view of the lake. A covered boat lift and large covered dock that includes a diving board together with a floating dock gives you everything you need to enjoy the lake lifestyle! The location of 222 Windward Lane lets you have a good view of the lake but does not put you on big water – no big waves to worry about! Good water depth at the end of the pier too! Being in the Blue Creek area of Lake Martin makes 222 Windward Lane close to Auburn and by land – close to hiking at Cherokee Ridge, and area restaurants such as Niffer’s, Oskar’s and Louie’s. By boat this lake home is close to Blue Creek Marina, Chuck’s, and StillWaters.